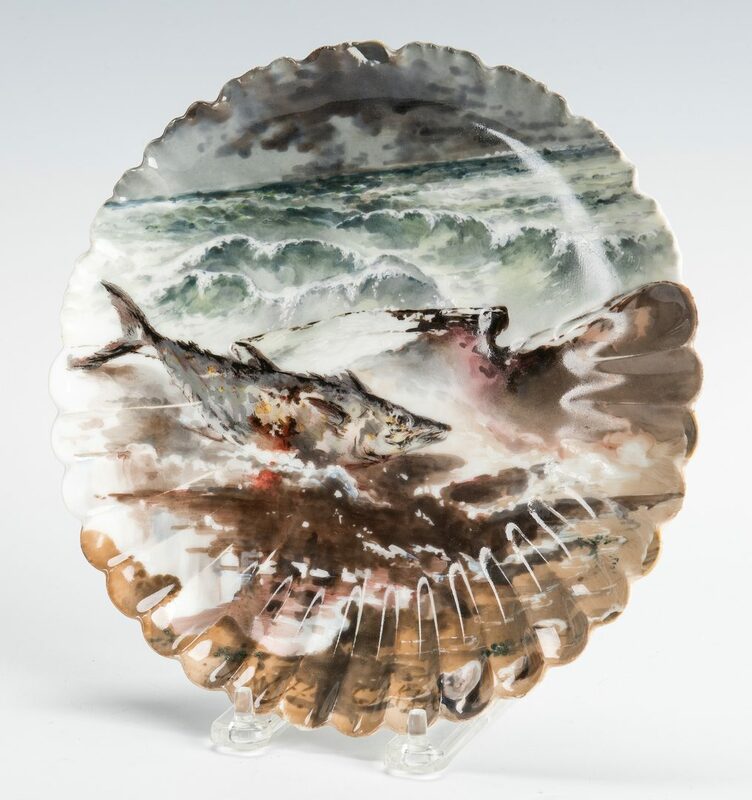 Haviland Limoges porcelain fish plate from the Rutherford B. Hayes service, designed by artist Theodore R. Davis for the White House, depicting a fish carried onto a beach by the surf, with cresting waves in the background, signed lower right “D”. 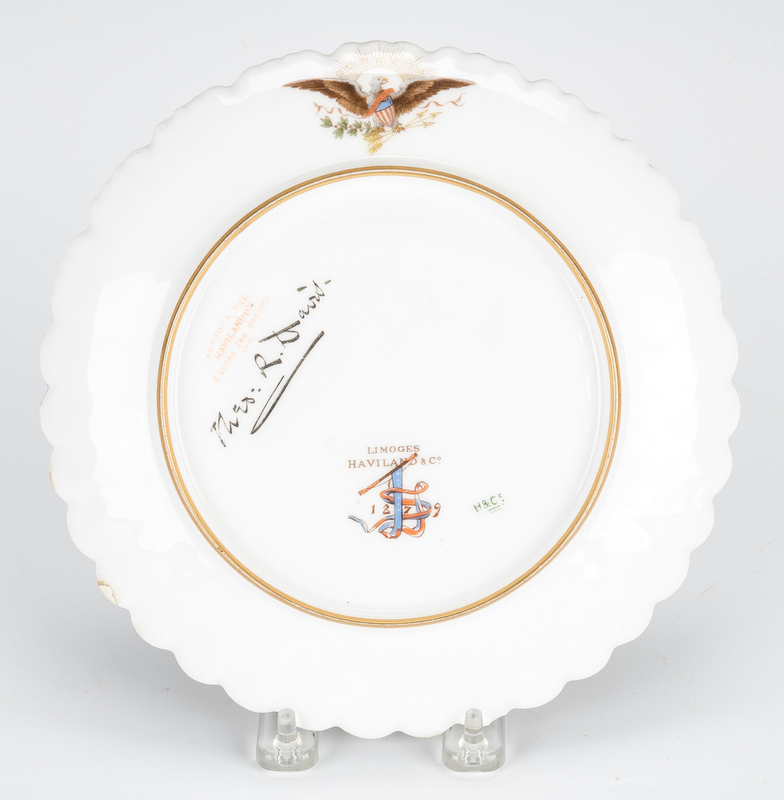 The back contains the full artist signature with TD cypher and pennant mark, presidential eagle vignette, and Haviland Limoges mark. 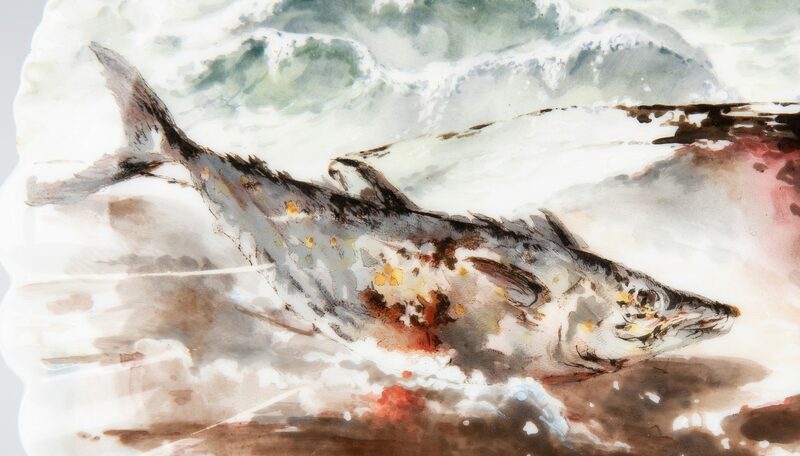 (Mark illustrated in the book Official White House China, 1789-the Present by Margaret Brown Klapthor, p. 107), 8 1/4″ dia. Provenance: Tennessee estate of a former New Jersey resident. 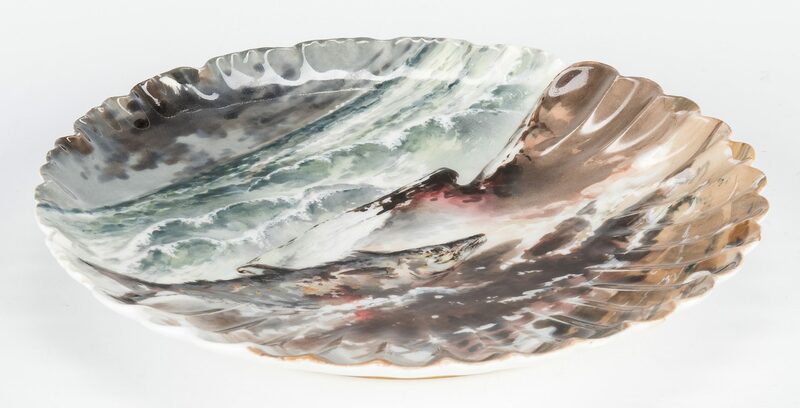 Note: The Hayes Service is considered one of the most important, imaginative, and extravagant porcelain services ever produced. 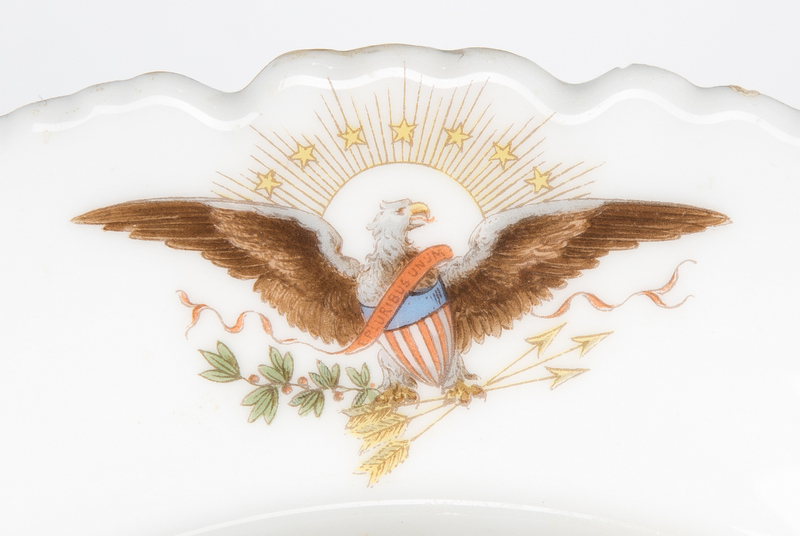 Negotiations for the new state dinner service for the White House began in 1879, as it was customary to order new porcelain when a new president took office. 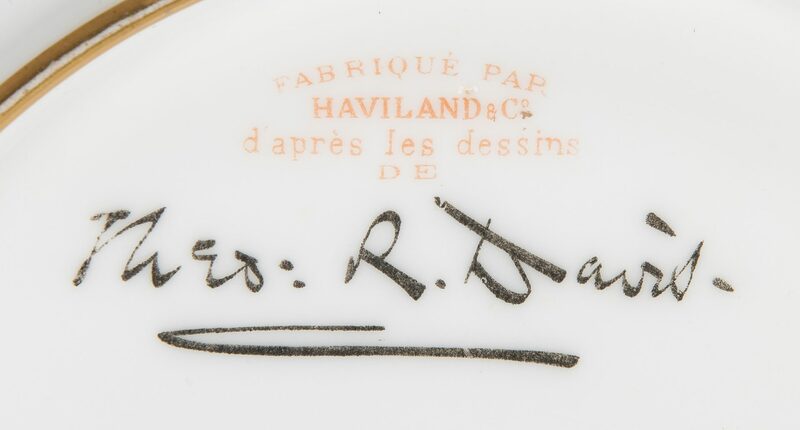 Haviland was awarded the contract over Minton and Wedgwood. 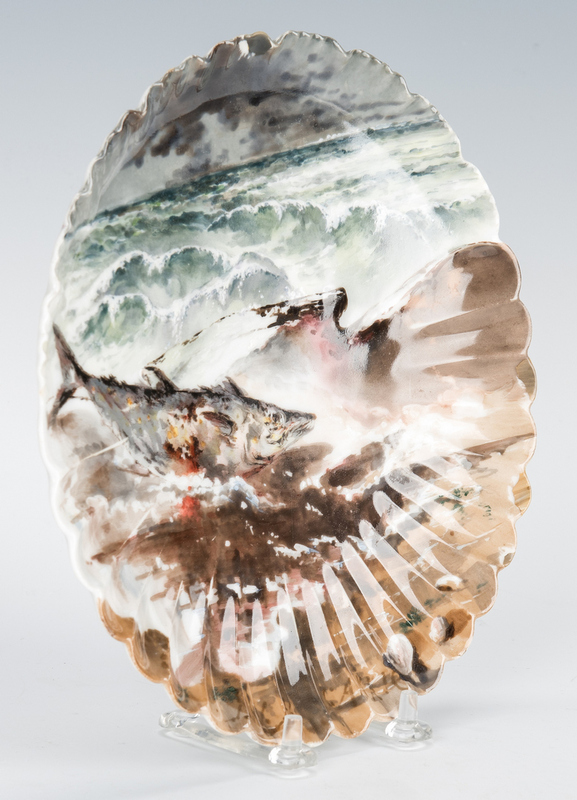 During a chance meeting with Mrs. Hayes in the White House conservatory, Theodore R. Davis, an artist for Harper’s Weekly, suggested the service be designed with exclusively American flora and fauna, with each piece having a different decoration. Mrs. Hayes liked the idea so much that she asked that Davis assume direction of the designs. 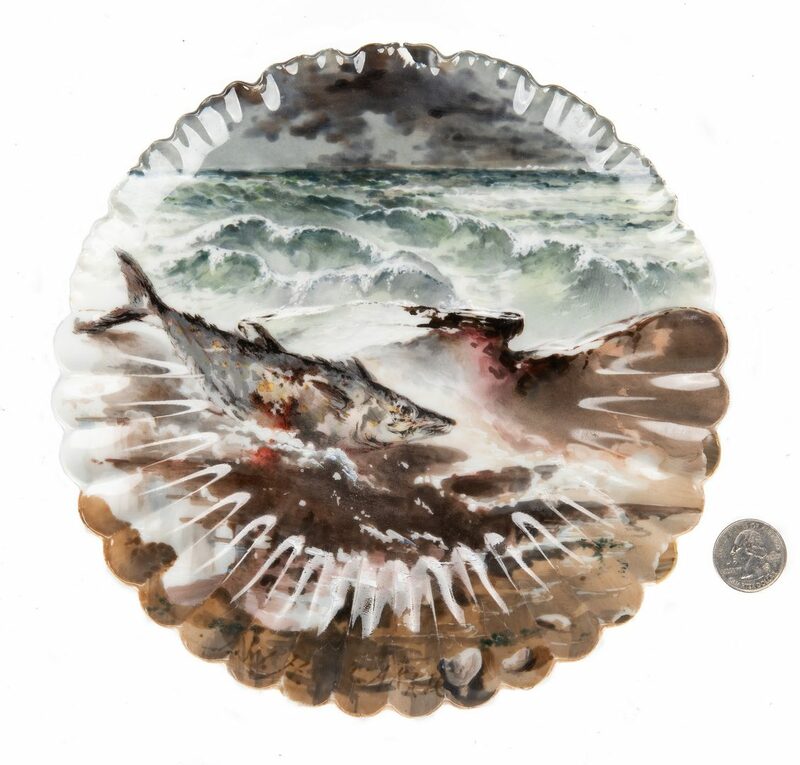 From his drawings, etchings were produced for transfer of the outlines to many new dish shapes; basic coloring was applied by chromolithographic and decalcomania processes and then shaded by decorators. 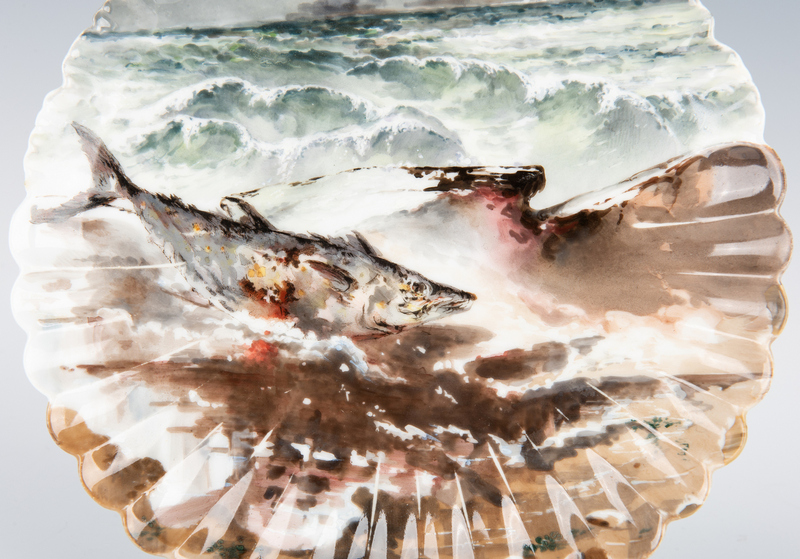 It debuted to mixed reviews from art and design critics, but the service was wildly popular with the public. 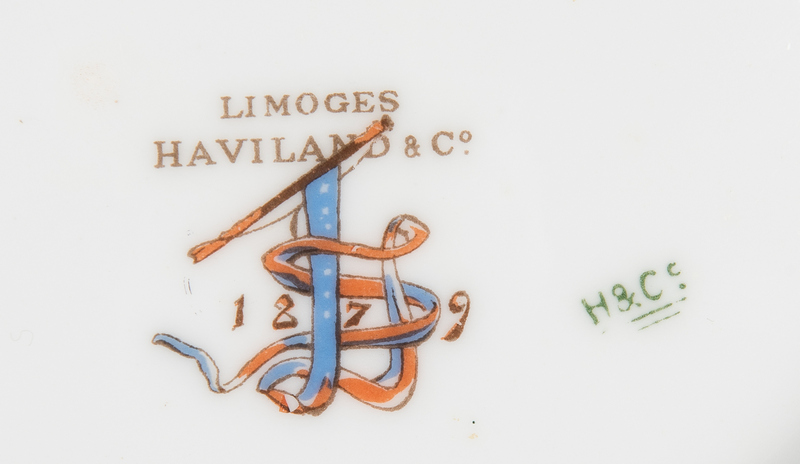 As a result, some of the Hayes designs and forms were patented and reproduced for public sale as well, but on these the pennant mark dated 1879, unique to the White House service, was replaced by a blue 1880 patent mark. (Source: whitehousehistory.org, “Official White House China 1789-the Present” by Margaret Brown Klapthor). Klapthor quotes Davis that many pieces admired by Hayes’ successor, President Chester Arthur, were removed from the White House during the summer months and taken to decorate the dining room of his vacation home. 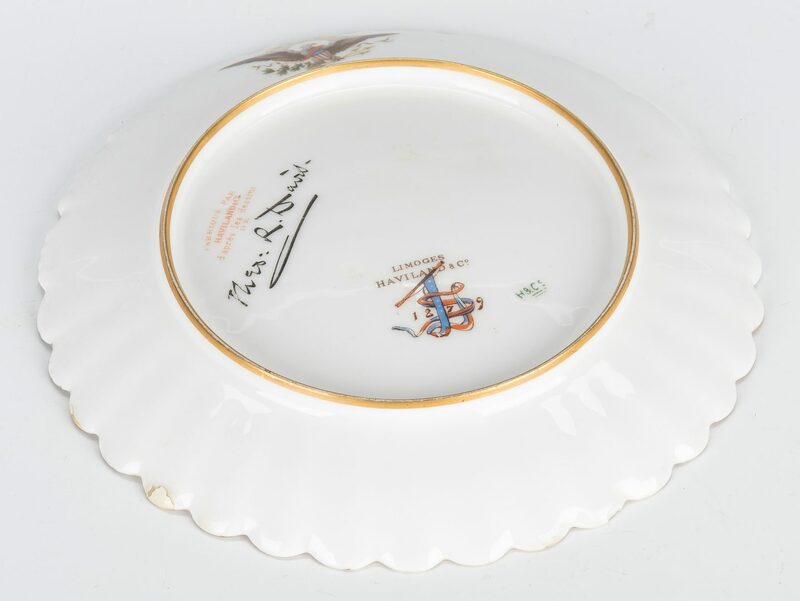 She also notes that “it is possible that the sample china which came into this country to the stores in Washington, New York and Boston during the summer of 1880 had the same mark as the set delivered to the White House, for the patent on the designs was not secured until August”. 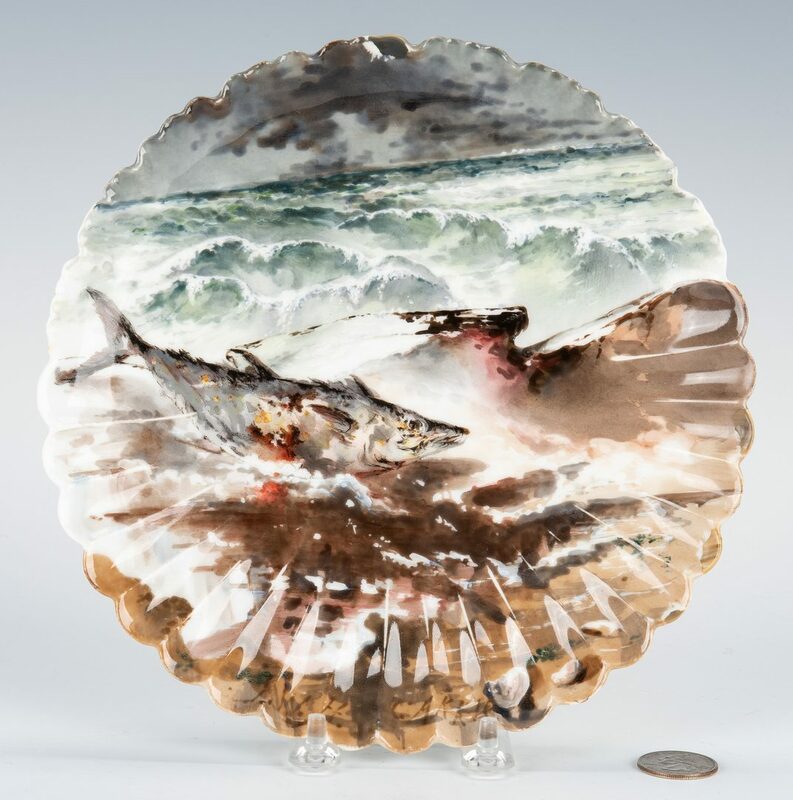 CONDITION: 1/4″ edge chip to underside of rim at bottom, 3/8″ shallow flake at top rim with attempt at repaint; a couple of other miniscule flea bites to rim, and 3 small edge chips with overpainting.